August 2018 National Numbers Puts the Las Vegas Real Estate Market On Top Beating Out Former Cities Seattle and San Francisco As Home Prices Accelerate Nation Wide. 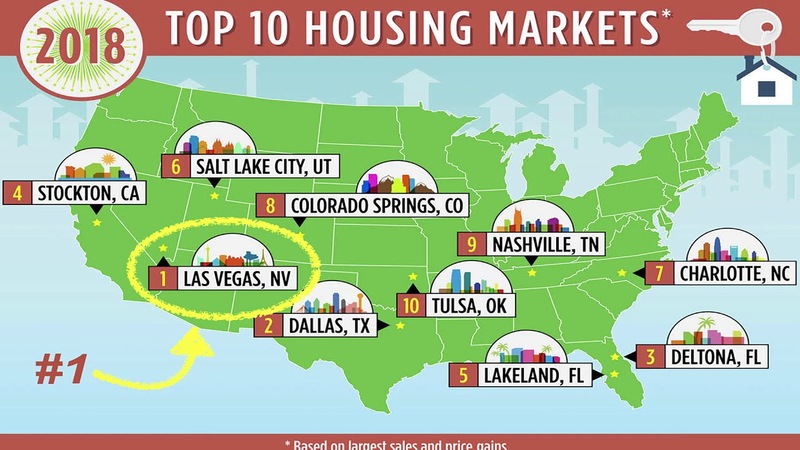 Rising at one of the fastest rates nationally, the Las Vegas housing real estate market is on fire and continues to heat up with sales prices rising, buyers paying record prices but below other major cities, and builders battling to keep up with the demand. Las Vegas house prices were up 16% in April of 2018, with the median sales price of single-family homes sitting at around $298,000. This means people who own property are gaining huge wealth fast. According to data from Numbeo.com, Las Vegas still remains the best value for ‘cost of living’ over other major US cities. Vegas is constantly attracting new residents, people looking for work, and people looking to rent. There is huge opportunity for potential buyers, and obvious massive gains for existing owners. Experts analysing the Las Vegas market have reassured investors that although commercial and residential property markets continue to rise steadily, there is no bubble. The market is predicted to settle in 2020, however currently is showing no signs of slowing. According to the OCR, more than 70 per cent of prospective home buyers say they aim to secure a property by the end of 2018. Blue collar workers are trying to make their dreams of early retirement a reality as they put money into a market that is predicted to have fantastic solid returns for the next few years, and beyond. Retirees from California are flocking to adult communities like Sun City Anthem looking to cut their expenses and retire in style. William Margita, a local Las Vegas luxury homes real estate agent and industry leader with more than 22 years’ experience, spoke with confidence about the state of the market. Margita has been in the industry since 1995 and is a third-generation real estate professional. He is a reconized expert in the Las Vegas market, spending decades watching the market – including its ability to fall, recover and subsequently go from weakness to strength. “There are thousands of hidden treasures in the Las Vegas market just waiting to be snapped up – and real estate investors just keep hitting the jackpot in this town.”. His hot real estate tips for the Vegas market include buying the smallest smaller or lowest value property in the most expensive communities you can afford to buy into, and not ruling out Las Vegas strip condos. Ashley McCormick, a REALTOR with Urban Nest Realty, says “The most majestic landmark buildings is Vegas boast multi-million dollar penthouses with all the designer amenities, but also have studios or smaller apartments that will hold amazing value. For a price point of $200,000 you could very well become the proud owner of a properly in the same highrise”. McCormick aslo notes the diversity between high rises, condos and condo hotels. She just listed the lowest priced condo hotel room for sale in Las Vegas at $150,000 at the Platinum Hotel and adds “the opportunites are available for those looking”. Condo hotel rooms are unique to specific markets and a product that continues to be popular in Las Vegas. Investors who made the wise financial decision to pick up property in Las Vegas 5-10 years ago are reaping the benefits of the rental market in spades. For this reason, many medium to long-term investors are unwilling to sell their properties as the returns on investment properties are extremely high and they are enjoying the appreciation of their properties. The Vegas market continues to heat up, after it ranked the #1 city for real estate investing in 2018, and the experts say this lucky streak is set to continue. Inventory is low because buyers are hungry for opportunities in the Las Vegas market, although the construction sector is doing its best to keep up.